Frugal & Fabulous: Review: Surface Eco-Friendly Skin Products! Review: Surface Eco-Friendly Skin Products! I love trying new skin products, especially ones that are eco-friendly! So I was thrilled when my friends at Surface Skin asked me to test out some of their products! Surface Skin is an eco-conscience collection of salon exclusive, high performance skin care products formulated with certified organic botanicals and sustainable harvested ingredients to respect personal health AND the Earth. Surface is available exclusively at professional salons throughout the US and Canada. 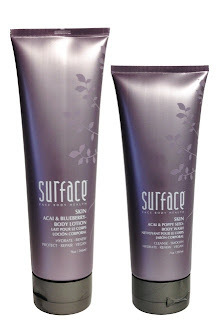 The Surface Skin Acai & Blueberry body lotion is a light, refreshing lotion that goes on smooth and absorbs well. I like that the scent is not over powering and it does not leave your hands feeling greasy. This is a lotion I would use every day, all day - perfect to leave next to a bathroom sink or by your desk at work. Because the coverage is light, you can get right back to doing whatever you were doing before you put it on which is important to a busy girl like me! This lotion is a vegan lotion that is formulated to renew, brighten and protect your skin from environmental damage. The Surface Skin Acai & Poppy Seed Body Wash is a smooth, sweet smelling body was that lathers nicely but does not overwhelm. It works well on my sensitive skin and leaves my skin feeling soft and clean. This body wash is also a vegan product and is formulated to hyrdate and renew the skin. It is sulfate free and the poppy seeds act as a natural exfoliate! Together, these two products have left my skin feeling silky soft with a nice fragrance! Click HERE to watch a video and learn more about Surface Skin! Verdict: I love Surface Products and I hope you will too! Ask for them at your local salon!